First of all, thanks to David Anthopoulos for finding my error that dropped him one place in the standings. That is integrity. Do not trust my numbers. This contest requires significant time on my part, and there will be errors. Please verify my figures and let me know of mistakes. The guys in green battle the Cavaliers tonight, and we are going with total points scored by Boston. But you can pick up an extra three points by naming the second-high scorer (Kyrie Irving is often the high man), and get three more points if you get the 2nd-high-man's point total exactly. 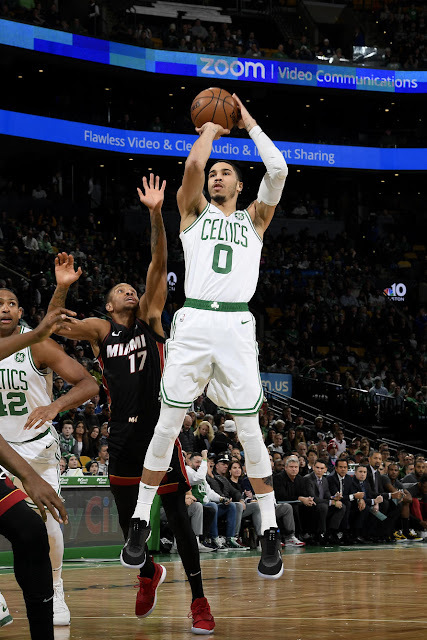 Ex: Jayson Tatum scores 25 points as 2nd-highest scorer. You get three points if you name him as such. You get three more if you nail the 25 points. But you still get three points if you named wrongly Jaylen Brown 2nd-highest (no points on that), but you guessed the point total (25) correctly. Hope I made it clear.